To combine Malfy Gin with a can of Sanpellegrino Sparkling Limonata, importer Biggar & Leith selected a custom Do-It Bottle Neck Hang Tab. 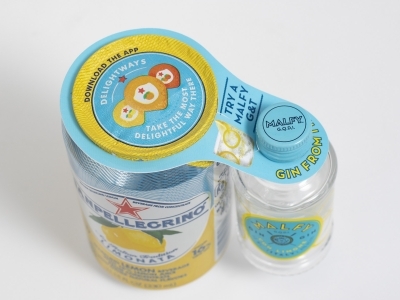 Digitally printed on both sides, Do-It’s 2-CHD Bottle Neck Hang Tab is designed to slip over the top of the Sanpellegrino can and the cap of the 50 ml bottle of Malfy Gin. The bottle neck hang tab fits tightly over both components holding the sample securely in place. Together, they make a great drink and a great display combination that gets noticed on a crowded shelf.